Before doing this,let me say what are sitemaps and how they will help us.The reason we use them is,they will help google bot to crawl,index pages of your site and tell you if there are any problems when they try to index it.It also helps you to know,how many pages exactly are indexed,and what people searched in the search engine to visit your site. Let me explain the detailed procedure on how to submit your blogger sitemap to google. 1.First,go to google webmaster tools and sign in with your gmail account. 2.After you logged in, you will see this asking you to add a site. Add your blog url(ex:kranthitips.blogspot.com).Don't add with http or www. 3.Next,it asks you to verify your site.It is just to confirm whether you are the owner or not. CLICK on the 'verify your site' link. 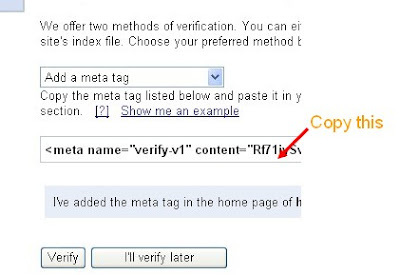 4.There are two ways to verify your ownership but, there is only one way for the blogger users to add a metatag. Now,sign into your blogger account>click the layout button>Edit html and paste the metatag just after the head tag and save the changes. 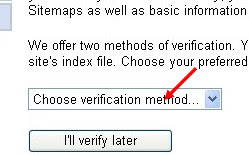 and click the verify button in the google webmaster tools and there will be a confirmation message saying that you have sucessfully verified. and click the 'Add General Web Sitemap' button. can blogs with "Blogger: Content Warning" be indexed/veryfied at all?? Hi, great detailed explanation on how to do this with Blogspot. I'm wondering if you know of some sort of issue with feedburner re-direct and the sitemap? It seems that not all of my pages are being indexed by Google. Very strange. 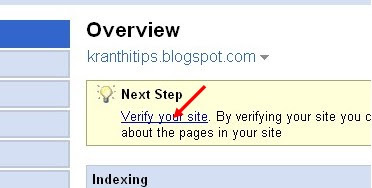 Don't type www.yourblogname.blogspot.com in the Google Webmaster tools dashboard. You just have to type "yourblogname.blogspot.com"(excluding www) and click on ADD SITE. and your blog is not linked to giantsnfl.blogspot.com . In short words,"If you sign into blogger,your email address will appear on the navbar of each and every blog you visit. Ok- so yeah I'm a newby too and I appreciate the tips about the sitemap stuff. However, what is the difference between an 'atom' and 'rss' file to begin with and is one better than the other? I am a new blogger and technically challenged. I was able to follow your step-by-step process and was able to submit my site map to Google. Thanks!! sitemap to Google. When I first created my blog, the name I gave it was giantsnflblog.com. Later,in the publishing section, I placed the following name nygmennfl.blogspot.com in the blogspot address field. I like the name nygmennfl for my site. the site. I do not know how to fix this. If you google my site, with key words such as New York Football Giants, NYGmen, New York Giants, their search engine does not pick up my site. I noticed articles I have wriiten on other sites are picked up. Please help me here. I would like to have this corrected. great tips. although the report is error cause i redirect my feed to other feed generator, google still find my last update. I tried to follow the steps, but adding the sitemap failed: as I'm blind, I saved the page about this tip as an txt-file, and tried to follow the steps as you described. But when I typed the url of the sitemap in the field, I got a message I typed the url of a file that isn't on that page. But I never found a sitemap file available for download or don't know how to create it. I used the link example.blogspot.com/atom.xml and example.blogspot.com/atom.xml, but with the same result. Could you please contact me with your help on katty dot geltmeyer ad safe-mail dot net ? I also have a question concerning adding an alt tag to my photograph on the blog, I don't know where to add the required html-code. In the template? Or anywhere else? How to do that? I tried to follow the steps, but adding the sitemap failed. Please help! Please email me mazda113(at)gmail(dot)com. Thanks! Hi I like your style of explaining with images, etc. My question is: how do I know if I did it right? My site hasn't shown up in Google yet even though it has only been 2 days. Is there a way to know if I have done it correctly/registered correctly and added the right HTML's? I am totally new at this ur posts are helping me a lot. Thanx a ton. For those of you having issues with feedburner; use (feeds/posts/default?redirect=false) instead of the typcial atom.xml or rss.xml. Google accepts it and properly index's everything! Which template are you using..?? Sometimes the problem is with your template too.. I visited your blog and found that you didn't added the Google Verification Meta tag. If you didn't verify your ownership in Google webmaster tools, how can you add the sitemap ?? Pls, read the article carefully and completely and try once again. This is really awesomely written. Step by step is definitely useful for newbies. However there is a bug :) in your post. Please change the google webmaster tools link target url from "http://www.blogger.com/www.google.com/webmasters/tools/" to "http://www.google.com/webmasters/tools/"
I am getting this warning when I submitted my blog to Google Webmasters. Too many tags describing this tag. Please fix it and resubmit. Does this warning prevent google crawlers from entering into my blog? Is this warning really a problem? There is a simple solution to this..
Just delete your present feed and add the feed url like this next time. and you have to pay some $$ for that.After that,you have to redirect username.blogspot.com to username.com from that registate service Control panel. Really Really Helpful, Thank You! I;ve added a link to this on my blog (http://discovery4x4.blogspot.com) due to the fact I think It's really Helpfull. Thanks a lot. I have been able to add the sitemap finally. I am not able to find out what I should put and how to findit out ?http://myblog.blogspot.com.what? Hi I am also having 3 problems and i need to know howto fix it . 1.URL not found:when I got to overview to see. it works!! my blog is looking legit!! Im having the same problem as Chessyman. This url is not allowed for a Sitemap at this location." is message at google sitemap. Any ideas? thanks buddy,my year long journey to solve the problem at least it si solved.tahnks a ton. what is the different between putting 'www' or instead just USERNAME.BLOGSPOT.COM? I mean, related to google crawl or pagerank? Thanks for the info. Much appreciate. highly man. Your niche is very competitive! great! i finally got it! thanks! Thanks a Ton..your step-by-step guide was very useful. Thanks i have no question it works perfectly.You are kind. I submited My url but google reported problem after 24hours. 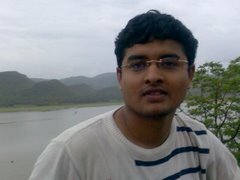 At first i too scratched my head to find “HTTP error : 404 not found” whether i give atom.xml or rss.xml or others..
and i added meta tag for http://www.justnareshwb.blogspot.com and trying to add sitemap to it.. I really dont know how both are automatically added to dashboard. So i added metatag for justnareshbw.blogspot.com and then tried to add sitemap by atom.xml and it was successful. So guys please check if ur doing it for a wrong URL as both URL (one with WWW and one without ) will be added to ur dashboard automatically. Done! :) thanks!! Please keep posting! I like relation blog related community. ok... done with this... next tips!! thank you so much for helping me! you have a very nice guideline especially for beginners like me! thanks again! When I paste a code to add something to my sidebar, what ever it is that I am trying to ad isn't centered on my sidebar. How can I get all things to appear centered down my sidebar. I am new your site, my friend just introduced me last night. I am loving it so far and can't wait to explore around it. Thank you so much. Ha! I actually figured it out myself by looking at the coding of other stuff on my blog. Anyways, I am going to explore your site and I can't wait to see what I can learn. anyway, can you give a tutorial on how to customize our default comment page? I really like your commenting proccess. Well I've found this site very helpful and managed to do everything and after a few days of really enjoying my new blog I noticed google stopped indexing my posts. So I changes the rss.xml to rss.xml?redirect=false&start-index=1&max-results=100 and that works but now I get 404 not found. Is that because I now have to wait until the sitemap is processed? I am wondering if its really processing or just stuck that way because when I only submitted rss.xml it was processed very fast. i have done all that you have told but could not upload xml file on my account.so can you please tell me how can i upload xml file on blogspot.com in my profile? omg. i never would have thought it was so easy...thx! Note: If you are using Blogger and has recently directed your feed to FeedBurner, make sure you change your sitemap URL in Google Sitemaps to http://yourblog.blogspot.com/rss.xml?orderby=updated instead of just http://yourblog.blogspot.com/rss.xml otherwise an error would occur in Google Sitemaps. We've detected that your verification file returns a status of 404 (Not found) in the header. I tried to add meta tag and couldn't get through your step.5. I've copied the verification code which started with meta name="verify-v1" content="xxxxxx="
Why did it swap between meta name and content after saving the template? Is this why google cannot verify my blog? How do I stop it from swapping around? 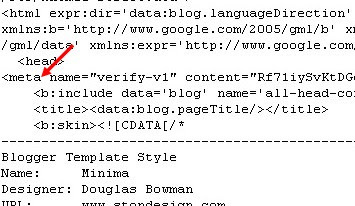 So I copied and pasted the tag and in was like meta name="verify-v1" Content="string"
So now what? It wont verify that way and I keep trying to change it and it wont stay the first way. And I don’t have correct words to proud you. Thanks. And I have someone doubts about Google ad sense and creating blogger. How to I approach you. Plz advice how can i add keywords in metatag? I've been trying to figure this out for a long time! Thanks it was quick and easy for all of my blogs. Who knew it wasn't as complicated as is seemed. When i submit my blogger blog to google after some time my most of the files got blocked by robot.txt...what can i do to unblock my content of my blog. Don't worry mate, it is common for all blogger users. Google don't crawl Blogger label pages. When i submitted my blog to google they shows that 5 URL's are restricted by robots will be there any problem due to this. thats y i am visiting daily to this site thanks. but when i site map it is telling that ur account is pending y man..? I get following error. Please advise how can I fix it. I really appreciate your help. "This url is not allowed for a Sitemap at this location." I'm having trouble submitting my sitemap. I receive the 404 error. Can you help? I'm having trouble submitting the sitemap. I added the meta tag, verified the site, added the code but clearly I've done something wrong. Help Please!! tell me difference between atom and rss? Thanks for this information. Its very helpful. at my webmaster tools ti says that my blog support a MRSS Feed. how do I add a sitemap for MRSS Feed? What will I do now? Please help me. I think many of us got this error. Thanks a lot, may Allah bless you. Thanks a lot. My blog appeared in google search, but if I enter the URL of my blog, google does not search it. It searchs it by title of blog. What is the problem? Hi,i have submitted my sitemap as u instructed here in ur blog,after 2 days i checked webmaster tool page,it says Error in ur page. Please help me on this,and say how to add metatags to all single posts. thanks for the tutorial buddy..i already did what you instructed and applied it to my blog ( http://koreasbest.blogspot.com )and i've got no errors up to this time.. hope it will works..
i like ur artikel very easy to understand! especially a newbie like me..
Hi! I erroneously indexed my site in Google WITH WWW but I already changed it to one WITHOUT WWW. The Google acknowledged it but they recommend for a 301 redirect. Can you help me with this? Thanks! Hi,In webmaster tools >>>Content analysis page in the Meta description issues there is a link that is showing 24pages Duplicate meta descriptions what this means.? Thanks for the info on this topic. Do you know how many times I tried (prior to now) to do this and nothing worked. Hi, I was just wondering what the difference is between rss and atom? And can you put blogs there such as livejournal blogs as well? Great work indeed. I am a newcomer & learning. By following your instruction I could successfully add my site to Google webmaster as well as I submitted my site's sitemap to Google. wow realy great post kranthik can i know where ur from ? means country=?, state=? & city=? hello Kranti i followed all your seo tip but even my blog is not appearing in search engine my blog i submitted my blog to google 2days ago even my blog is not displaying pls help .. whether there is any problem with that template...??? I'm new here, What can I call u? What a huge help! Thank you so much! I have a qusetion.If I want to submit my site to yahoo and google, that's mean I have to put two meta tag?Am I correct?So far almost 2 weeks I add these meta tag, but my site still not index.What is the cause to this problem?Is it because I put two meta tag? Thanx kranthi !! it works !!!! 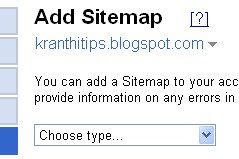 for a while, i've been wondering what to submit on sitemap.Thanks for the tip! Hi Buddy! I tried this procedure, but i failed at verifying step. error is VERRIFICATION STATUS: Not Verified, We've detected that your verification file returns a status of 404 (Not found) in the header. it seems that doing this will only allow me to submit 24 urls. Is there a workaround to submit all the posts (around 600) in my blogspot? and i hope it will work. hello - can you help? i've entered all my blogs and websites with the www. included. does this matter? do I need to re-do them all without the www? and - what difference does it make with or without it?